As Jacques Dupin wrote in the last volume of the artist’s catalogue raisonné of gravures: ‘Lapidari’ is a large book: 24 engravings respond to 12 descriptions of stones, taken from anonymous 15th-century Catalan authors, selected and prefaced by Pere Gimferrer, a major Catalan poet who has also written a number of books on Miró and Tapiès. 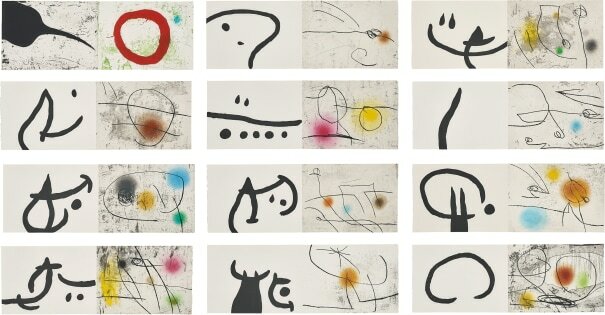 Twelve stones chosen, the inscription of their names already an invitation to engrave: Berril, Calsedonia, Estopaci, Balays… Miró was taken by the number twelve and chose to celebrate each stone with two engravings facing each other. The left page has thick, powerful and spare graphic quality; the right page, a drawing composed of quivering lines on a background animated by smudges and scrapes like claw marks. Vaporous disks released into the air give the illusion of a third dimension. What is retained from the stone is its simplicity, its opposition to the earth, its roughness and its weight. The book carries the subtitle ‘The Book of the Properties of Stones’, a fine definition of Miró’s last work. Jacques Dupin, Miró Engraver IV 1976-1983, Daniel Lelong éditeur, Paris, p. 14. The complete set of 24 prints including 12 etching and aquatints in colors and 12 etchings in black, on 12 sheets of Arches paper, the full sheets, folded (as issued), with colophon, title page, texts, and original linen-covered portfolio with printed spine and semi-precious stone. Signed and numbered 90/130 in pencil on the colophon (there were also 45 copies in colors with wide margins on Guarro mounted on Arches, and 15 hors commerce copies in Roman numerals), authenticated by Rosa Maria Malet, director of the Fundació Joan Miró, Barcelona on the reverse of the colophon dated '28/I/2014', published by Galeria Maeght, Barcelona, the 24 prints folded in 12 frames.